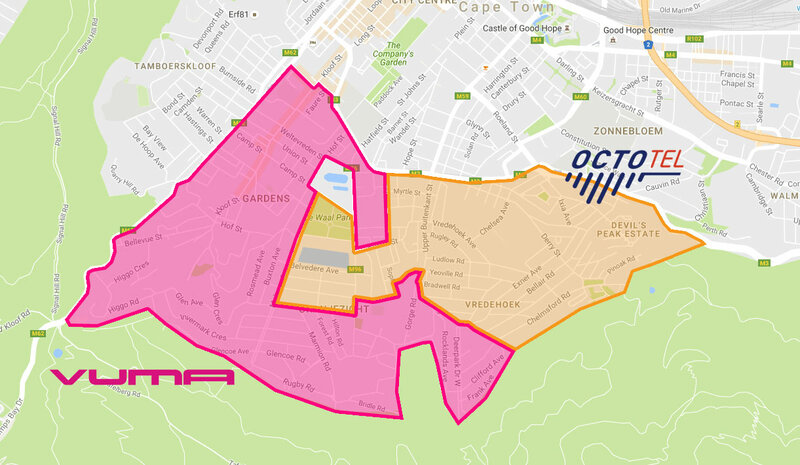 Webafrica Has Partnered With Devil’s Peak Vredehoek (DPV) Neighbourhood Watch! We are pleased to announce that we are partnering with Webafrica to help keep our neighbourhood safe. This means that the cameras in this area will no longer be subject to the occasional data-send lapses that plague the overcrowded Wi-Fi networks, which means increased and stable security footage, which will lead to more up time and better quality coverage. Which Area Do I Fall In? When Is My Area Going Live? For Octotel customers: Their first customers in Gardens are going live in September with Vredehoek going live in October. For Vumatel customers: Go-live dates are currently to be seen, and we will keep you updated! They have a variety of capped and uncapped packages available. You can view all their packages here. Sign up now to make sure you get your initial months free (either 2 months or up to 3 months depending on the area). Call them on 086 000 9555 or email fibreorders@webafrica.com and they will call you back. Ready for Superfast, Superfly Fibre internet? Of course you are! Sign up today, and soon your days of slow and unreliable internet will be over!